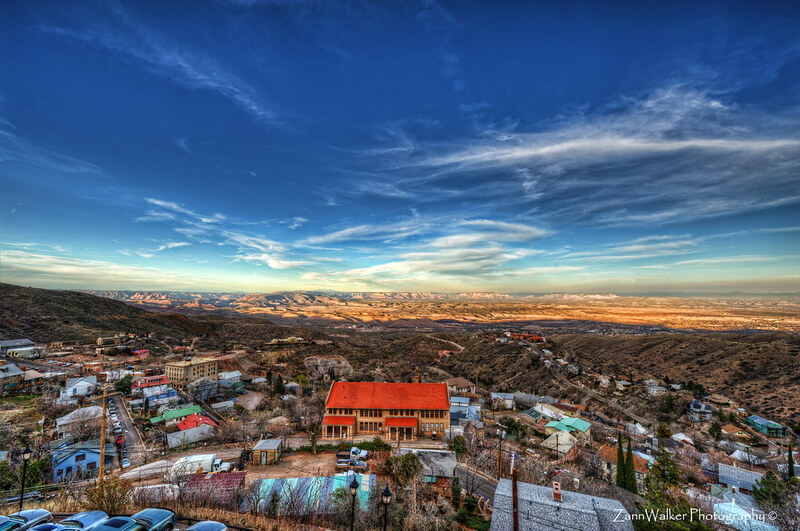 One of the reasons I wanted to stay at the Grand Hotel in Jerome is because they have a few rooms on the third floor with balconies that overlook the Verde Valley that lies between Jerome and Sedona. From our perch high on the mountainside we could watch as the glow from the setting sun ignited the red rocks on the far side of the valley, as the street lights in Jerome came on one by one. I was hoping for a few more clouds to make the sunset a little more dramatic, but it’s Murphy’s Law….when you want clouds, the weather is absolutely beautiful. I set up the camera on the tripod with the 14-24 wide-angle lens and my cable release, and as the sun went down we enjoyed a glass of wine and shot several five-bracket series of images. I’ve decided to cut back on my posting frequency. Fortunately, I have a day job that finances my photography hobby, but the downside is that I don’t have enough hours in the day to work, shoot, process photos, and do some of the other things I’ve been neglecting lately like housework and exercise. It’s time to get a little more balance back in my life. My intention is to post maybe three times per week, but we’ll see how it goes. Tomorrow morning I’m attending a workshop in Mesa on how to use flash, but on- and off-camera. On Monday evening, I’m attending another workshop on how to create a low-cost studio set up using everyday materials. I’m hoping these workshops will give me some ideas that I can use to start taking some great shots of Andy’s handmade jewelry and lapidary work. Have a great weekend everyone! Happy shooting! This entry was posted in Commentary, Information, Shooting and tagged architecture, Arizona, AZ, building, cable release, camera, D700, Grand Hotel, HDR, Jerome, Nikon, Paint Shop Pro, Photomatix, software, sunset, Topaz, tripod, workshop. Bookmark the permalink.